范一博, 车晓芳, 赵欢, 胡雪君, 曲秀娟, 刘云鹏. microRNA-1183通过抑制CBL-B的表达促进胃癌细胞的增殖及转移[J]. 中国医科大学学报, 2018, 47(3): 202-205, 211. FAN Yibo, CHE Xiaofang, ZHAO Huan, HU Xuejun, QU Xiujuan, LIU Yunpeng. microRNA-1183 Promotes the Proliferation and Metastasis by Suppressing the Expression of CBL-B in Gastric Cancer Cells[J]. Journal of China Medical University, 2018, 47(3): 202-205, 211. Abstract: Objective To investigate the effect of microRNA-1183 on proliferation and metastasis on gastric cancer cells and to explore the role of microRNA-1183 and CBL-B signaling pathways in this process.Methods MGC803 cells were transfected with a microRNA-1183 mimic. Real-time PCR detected the expression of microRNA-1183 in gastric cancer cell line MGC803. MTT detected the proliferative effect of microRNA-1183 on MGC803 gastric cancer cells. A Transwell assay detected the effect of microRNA-1183 on the metastasis of MGC803 gastric cancer cells. A dual luciferase reporter assay detected the binding ability between microRNA-1183 and CBL-B. The expression of the protein was tested by Western blotting.Results MTT assay results showed that microRNA-1183 promoted the proliferation of MGC803 cells. 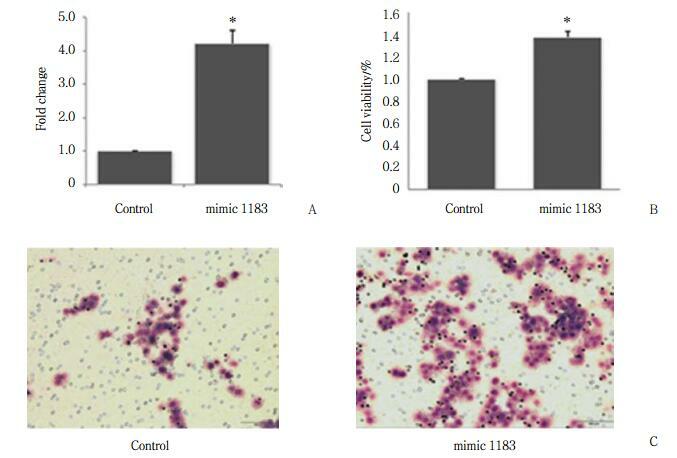 Transwell assay results revealed that microRNA-1183 promoted the metastasis of MGC803 cells. The results of BLAST contrast analysis show that CBL-B is one of the target genes of microRNA-1183. 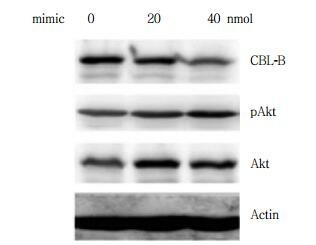 Western blotting analysis showed that the mimic microRNA-1183 inhibited the expression of CBL-B. 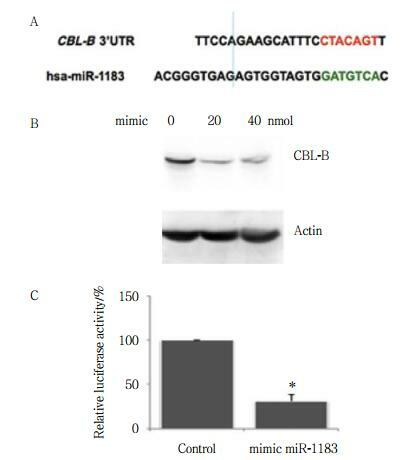 A dual luciferase reporter assay showed that CBL-B was the target gene of microRNA-1183. A CBL-B knockdown promoted the proliferation and metastasis of MGC803 cells. 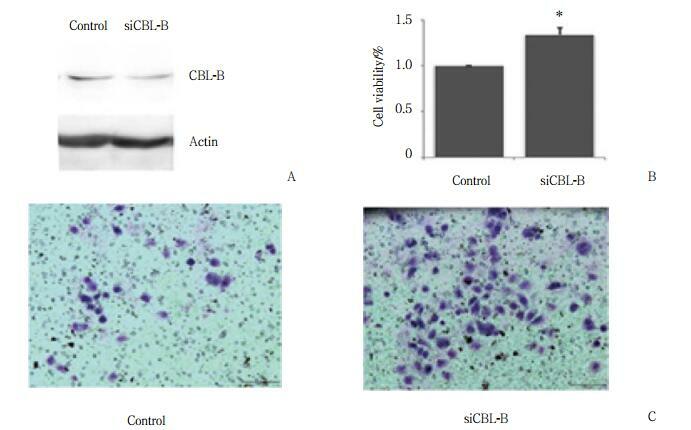 microRNA-1183 promoted the proliferation and metastasis of MGC803 cells by inhibiting the expression of CBL-B.Conclusion microRNA-1183 can inhibit the proliferation and metastasis of gastric cancer cell lines by inhibiting the expression of CBL-B.